Last year, TJC announced a major overhaul to the accreditation process in an initiative called Project REFRESH. The core principles of the new accreditation process are: simplification, relevance, innovation, and transparency. Essentially, the goal of the refresh is to simplify the survey process, post survey follow-up, and recommendations so that an organization can immediately take corrective action on deficiencies and affect lasting, positive change. The three major changes include: Elimination of Elements of Performance, replacement of the Criticality Model, and changes to post-post survey follow-up. Elimination of Elements of Performance (EPs) is the first revamp in the accreditation process. TJC eliminated 131 EPs from the Comprehensive Accreditation Manual for Hospitals. The EPs eliminated were around the those which were not deemed necessary in assessing safety and quality, were either duplicative of other EPs, or rarely used during the survey process. Replacement of Criticality Model is the second TJC update. The criticality model assesses four levels of criticality: Immediate Threat to Health or Safety, Situational Decision Rules, Direct Impact Requirements, and Indirect Impact Requirements. The new scoring model, known as the SAFER matrix (Survey Analysis for Evaluating Risk) continues to focus on safety, but makes the potential impact on patients, staff, and visitors clearer. During the survey process, a surveyor will evaluate the likelihood of an event to cause harm. As the findings increase, the placement of the standard EPs moves from the low/limited level to the upper/widespread level. 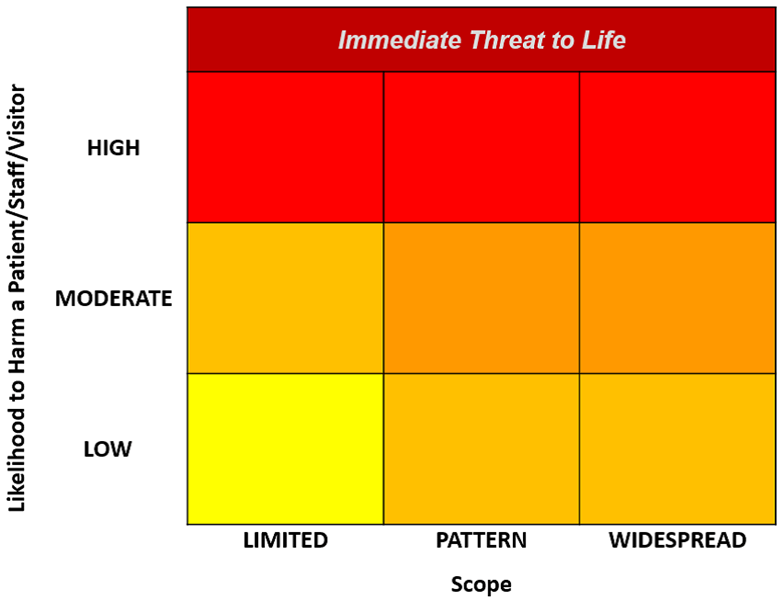 There are no changes to the Immediate Threat to Life process. Post survey follow-up has also changed with the new scoring model. The “A” and “C” designation (direct and indirect) is eliminated because all non-compliance observations are listed on the Matrix. Additionally, Measures of Success (MOS) are no longer required. Finally, the timeline for follow-up for reporting Evidence of Compliance has changed. All deficiencies cited must be corrected within 60 days. Beginning January 2017, TJC has begun using the SAFER matrix for the survey process. Are you ready for the changes? Click here for a quick overview of the SAFER matrix and other important TJC updates.